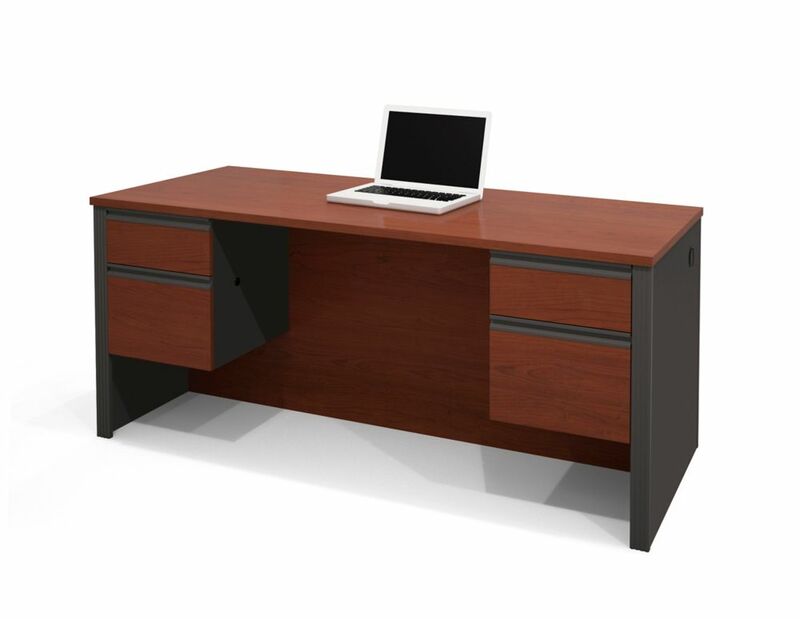 Be sure your work space has plenty of room as well as style with this modern Bestar computer desk. Accented with a red finish, this piece is design with thick panels and stylish lines that go with a variety of decor. Your work space will be well-supported on its sturdy manufactured wood frame. Keep it compact and organized with this desk, and still have enough room to store a computer, notebooks, and more. Prestige + 71.1-inch x 30.4-inch x 29.75-inch Standard Computer Desk in Red Be sure your work space has plenty of room as well as style with this modern Bestar computer desk. Accented with a red finish, this piece is design with thick panels and stylish lines that go with a variety of decor. Your work space will be well-supported on its sturdy manufactured wood frame. Keep it compact and organized with this desk, and still have enough room to store a computer, notebooks, and more.